Outside the iPad, crafting is a great way for juniors to hone multiple skills and for parents to spend some creative time with their little ones. But if you're not very crafty, coming up with junior-friendly craft projects can be a daunting task. Fortunately, now there's an app for that: KidsCraft. KidsCraft is a beautiful app filled with 20 unique craft ideas for juniors. 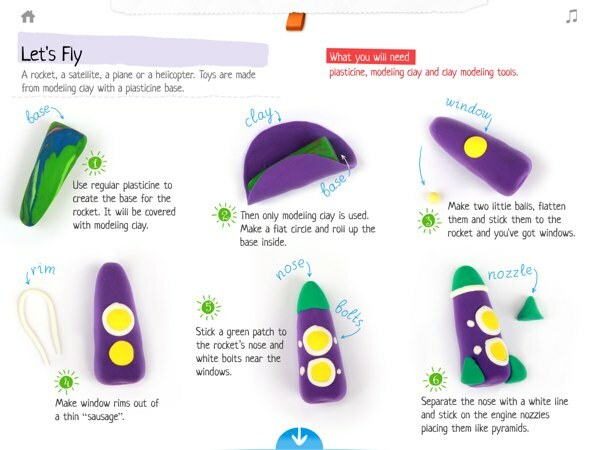 Designed by Russian children’s toy designer and book author Tatyana Makurova, KidsCraft contains 20 simple craft tutorials suitable for juniors ages four and up. In the app, you can learn to make cardboard toy cars, design decorated letters from thick felt, sculpt rockets out of modelling clay, handprint custom designs on t-shirts, paint without brushes, and more. Each project is presented in details along with a list of needed supplies, step-by-step instructions, and high quality photographs of the process and the final products. At the end of each tutorial, you can tap on a lightbulb icon to read relevant tips for adjusting the supplies that you do not have or suggestions for developing your finished works further. In terms of presentation, the app is really well made. It uses a simple interface where you only need to tap on a project to view it. Everything is laid out well, so it is easy to follow the tutorials. The instructions are clearly numbered, and the photographs are annotated to provide additional notes and info. There are also simple interactive animations scattered throughout the app to keep younger readers entertained. It is a minute detail, but a nice one at that. The app provides step-by-step instructions along with photographs to help you follow along. KidsCraft is a wonderful app that tries to spark creativity and imagination in children and adults through crafting. While building their own rocket ships, painting with wax, and other crafts, juniors can also sharpen their hand-eye coordination, color recognition, problem solving skills, spatial reasoning, and ability to follow directions. Designed to unite parents and children in creativity, KidsCraft projects vary in terms of complexity. I have not tried all of them myself, but my guess is that they can take anywhere from 30 minutes to a couple of hours. Several activities juniors will likely be able to complete by themselves, while others may require extensive assistance from the parents. When making preparations for the project, you can probably find most the items you need around the house. However, you may need to run to the store to get things like acrylic gesso, modelling clay, and gouache. Unfortunately the app doesn’t include a list of all the required supplies in one place to print, but hopefully the developer will add this feature in future updates. Finally, you may be interested to know that all of the projects in the app were made based on Makurova’s experience with her son, Simon. In the About section of the app, you can read how she was inspired to create KidsCraft to inspire other parents to engage in creative activities with their juniors. The projects vary in complexity, but never too complex that kids can't complete them by themselves. To be honest, I am not much of a crafter. I doodle and sometimes design cards on my computer, but I don’t make things with my hands very often. However, KidsCraft really kicked an urge in me to run to the craft store and start my own crafting project. I am really impressed by the fact that the app has 20 unique craft projects. Not only is it a great value for your money, but it also means that there is something for everyone. I also find it interesting that some projects can be combined together to create something even bigger. For example, you can take the cardboard cars, cardboard tunnel, and colorful block buildings to create a city set. Or, you can place the cutout zoo animals and place them in the forest diorama. All it takes is a bit of imagination! One thing that I wish to see added in the app is a list of materials, a short description for each, and suggested replacements for materials that we may not have on hand or cannot find at our local craft stores. I realize that the app already have these information in bits and pieces throughout the tutorials, but it would be helpful to have it accessible from one place. You can also get tips and suggestions for developing your projects further. KidsCraft is, in my opinion, a unique app. I have never seen other apps that are dedicated to providing juniors with high quality craft tutorials, so this one really shines for me. The app is beautifully done, both content- and presentation-wise. Go get it now. With 20 tutorials in one app, this one is a steal. Note: Thank you to KidsCraft for providing us with a promo code. We can’t wait to try all of the craft projects ourselves! Toca Tailor. Creative dress-up game for your little fashion protégé.